Branding - One of the great features about PT Distinction is it allows you to brand the software/app as your own. You can integrate with your website. 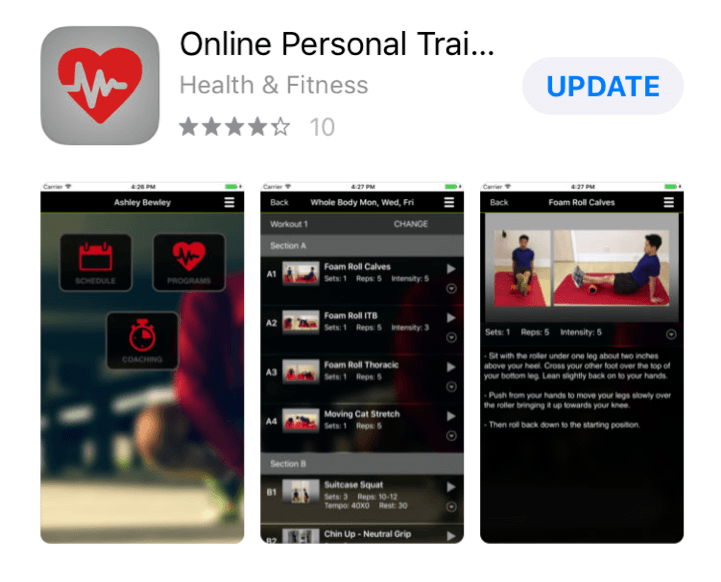 Unfortunately, with the Apple store it does not let the individual icon in the app store to be your own, so it comes up as the 'Online Personal Training App' and once download it then asks you to customise to yours. With Android, I believe it allows the icon to be displayed as your app. PT Distinction is currently testing their new version of the app which will hopefully be ready early in 2019. Navigation/Client dashboard - As the trainer, it is easy to navigate around the platform. Once logged in into your panel, you can go straight to 'set up'. Here you have the clients schedule, programs, coaching, assessments, tracking and forms. Each of these areas you can build templates for which are stored under templates to reuse and copy items easily saving time from repetitive tasks. Each client account has an 'Activity' tab where you can easily review your client's activity. Anything your client saves or checks in is presented here. Once seen you can mark as seen. Each client also has a missed tab. This shows you everything the client has had scheduled but missed. 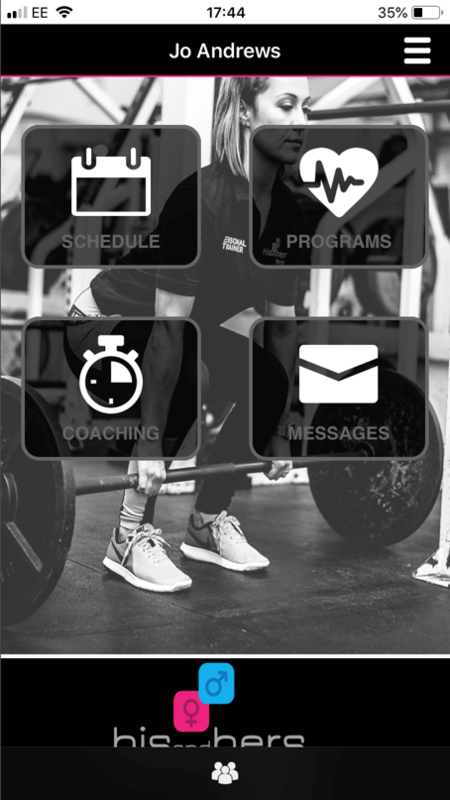 Coaching – under the coaching tab you have the option to add PDF, Text, Video, Spreadsheet, Meal Plan as part of your delivery to your clients. PT Distinction has generated meal plans available should you want to provide meal plan examples for your clients. You have the option of adding your coaching items to your coaching template library for future use which is easily accessible through a drop-down menu. Scheduling – The scheduling feature on PT Distinction allows you to see the clients week in an easily viewable calendar. Here you will also see anything you have scheduled for your client such as fill forms, results tracking, programs, coaching items, update progress etc. Having scheduled stuff allows the client to check in as having completed it quickly. This can then be seen in the activity section for the trainer or missed if they haven't finished it. Programs – you can quickly build your programs. Spending the time doing these at first will save so much time in the future and stop repetitive tasks. You can easily create templates as you go, editing and saving new ones. 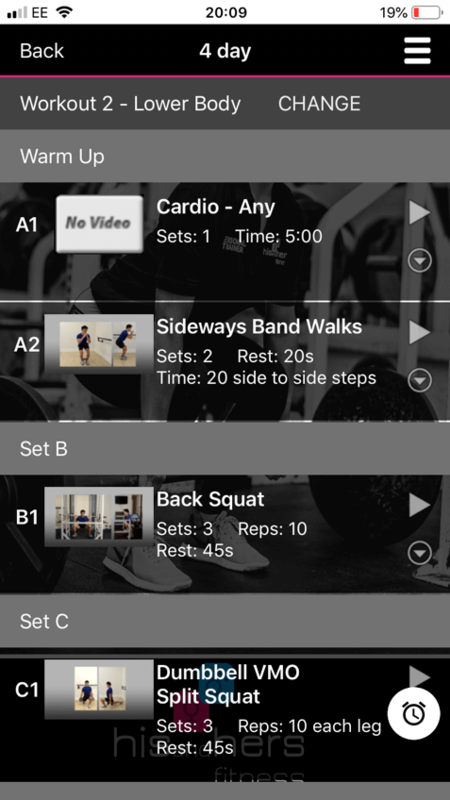 You can also easily copy workouts and sections of workouts and paste them into others. Clients also have the option to add exercises/any information/any notes to their schedule. Exercise library – PTD has a vast exercise library. It is also straightforward to add your custom exercises to the database. 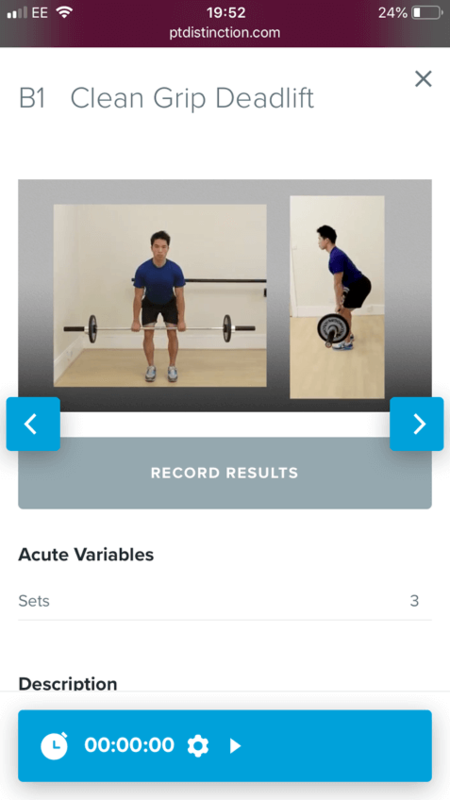 Should you find an exercise you like, but do not want to use the PT Distinction video demo, you can use PT Distinction exercise description and upload a version of your own. A downside is, uploads can take a while should you have a large sized video and slow internet speed! Forms - you can easily use the existing forms such as client profiles, questionnaires, PARQ’s, but you can easily create templates saving you time for when you reuse them. Automation - The automation part of PT Distinction is fantastic. You are easily able to schedule emails, automate programs, coaching etc. You can create and automate an entire training package that links through directly from your website. This can all be done through the pre-made packages section in PT Distinction. Groups - One of my favourite features on PT Distinction is the ‘groups’ as it saves me so much time! Groups can be used in different ways such as delivering group training, offering challenges, having your programs set up already. You can also create groups and send out material to 1 client or a large group at any one time. Some examples of groups I have in my account are habit based groups, e.g. eat more protein, eat healthy fats, drink more water etc., welcome groups, mail list groups, recipe pack groups. All of my groups are set to send material out ‘days after joining’ so I can add the clients whenever they are ready! When adding a new client, you can also stack groups and set the client to be added to that group on a specific date which again saves so much time. Putting all the hard work in first will save you so much time in future. Tracking Feature - you can easily add your tracking features to PT Distinction. Scheduling tracking so your clients receive reminders to complete things is a great way to get results. You can also set up new habits which are easily trackable. Some of my tracking features include - water intake, sleep, body confidence, measurements, stress levels. You can add assessments for your clients such as flexibility tests, movement screens, strength tests etc. They can also easily video themselves from their dashboard to allow you to see this. Also, progress photos are easily comparable once a client uploads them. Communication - As well as email and SMS, PT Distinction also has an in-app messaging service. You can set this to allow the client to message back or you can have this as one-way messaging, depending on what you offer. You can send instantly or schedule messages. Marketing - PT Distinction also has marketing resources to assist in growing your online fitness business. PT Distinction is very easy to use as a trainer and as a client. You can quickly login through a web browser and do all the features above from your mobile phone. As a client, you cannot, as of yet, complete forms through the current app. You can only complete forms through the desktop version. Completion of forms is a new feature on the latest version of the app (soon to be released). PT Distinction can integrate easily with popular apps such as MyFitnessPal, Fitbit, MyZone, PayPal. The client goes into their account and clicks into ‘add-ons’ and follows a short video on how to do this. All of the information inputted on these comes through to the activity session of the client's account. You can use Paypal to take payments (however I do not use this as I use a company called GoCardless as their fees are cheaper than PayPal). The latest pricing can easily be found on the PT Distinction website. At the time of writing, they have three options, depending on the number of clients. Master: 1-50 clients, 1.60 USD per client / 80 USD per month. They offer 30 days free trial. My clients love having the app and having their accounts. Everything is in one place for them. Some call it their little bible. “I love using my app as I can keep track of everything. It gives me full instructions on how to do a movement of an exercise, as we all know there are so many names and sometimes I forget the move I am required to do. With everyone having a smartphone nowadays this is the way forward to have your coaching always at hand even when you are not with them. I love it. There have been some issues with the integration of PT Distinction and WIX websites which my current website provider is. My clients logging in through the integrated part of my site have reported issues with items not saving, screen freezing, words overlapping. The support/helpdesk from PT Distinction is, and they respond very quickly when a problem arises. The solution to this at the moment is to use PT Distinction’s mini-site which can be customised to your website - this is also very mobile friendly. This is a WordPress site and has all the new features that the new app will have and there are no glitches to this. The current app (version 2) with PT Distinction also has some frustrations from a client perspective, such as information not saving after inputting. Again, this has been resolved at the moment by me sending all of my clients to the mini-site login way which is working fine. The new app will hopefully sort any of these issues out. 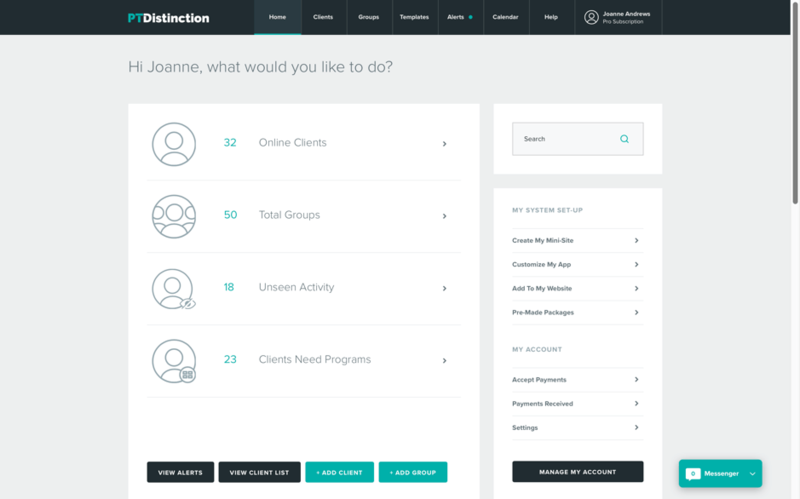 PT Distinction has so many great features that I think any trainer would love and benefit from using it with online personal training clients. With most of the population now using smartphones and the new app being launched imminently, PT Distinction takes a top spot on the market.